With over 3,000 styles to choose from, there's no longer an excuse to be having a 'shame on shoe' moment on Oxford Street. Luxury department store Selfridges, the behemoth which commands an entire block on Oxford Street, has today unveiled its new men's footwear concept. 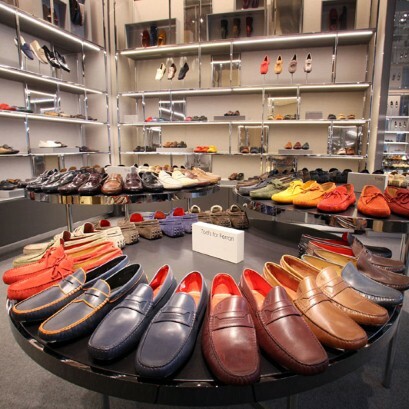 Its first floor is now home to 72,000 pairs of shoes, making it the largest men's shoe department in the world, with over 250 brands and a made-to-order shoe salon. Prices range from a reasonable £25 for Havaianas flip-flops to over £10,000 for bespoke boots by Tom Ford. There is even a section dedicated to driving shoes - Selfridges' best performing men's shoe category - with practical offerings from the likes of Tod's, Gucci, Carshoe, Bottega Veneta and Prada housed in a salon inspired by the bodywork of vintage Ferraris. "The new space is one of the cornerstones of our Menswear Masterplan - the ongoing development of men's fashion at Selfridges," explained David Walker-Smith, director of menswear at the chain. The concept follows in the footsteps of the women's Shoe Galleries, which launched at the Oxford Street site in 2010. Shoe giant Kurt Geiger, who owns hundreds of shoe departments in stores across the country, is responsible for overseeing the edit of casual and luxury shoes. A host of brands new to the Selfridges footwear roster, such as Kenzo, McQ, Burberry and Barbour have been welcomed into the fold while Lanvin, Versace, Dr. Martens and Trickers have all created styled exclusive to the store. In February next year, Christian Louboutin's red-soled men's collection will be housed in a dedicated boutique - a world first for the French designer. "Our aim is to truly amaze our customers, and take ownership of core categories within our business by offering the very best international brands within bespoke retail environments," added Walker-Smith. Just last week the retailer announced sales had broken the £1 billion barrier for the first time in its 103-year history.